In today's capital constrained economy the failure to manage risks can greatly reduce a company's access to capital, both equity and credit. Information technology is both the source of significant risks and the solution for effective risk management. IT Governance is the responsibility of the board of directors and executive management. It is an integral part of enterprise governance and consists of the leadership and organizational structures and processes that ensure that the enterprise's IT sustains and extends the enterprise's strategies and objectives. Are IT and business strategies aligned? Are IT risks understood and being managed? Is the quality of IT systems appropriate for business needs? Is there a sound business case for each IT investment? Are responsibilities and accountabilities assigned for IT investments? Is the IT investment portfolio managed adequately? Are new projects likely to deliver solutions that meet business needs? Are the new projects likely to deliver on time and on budget? Will the new systems work properly when implemented? Will changes be made without upsetting the current business operation? Is the workforce able to use the IT systems productively and safely? Are internal controls operating effectively? Is the enterprise in compliance with regulatory requirements? Ineffective IT Governance increases an organization's risk, decreases its' profitability and can greatly reduce its' access to capital. Companies incur significant risks, many hidden, as the direct result of ineffective IT processes that define IT Governance. Management has the opportunity to greatly improve its processes and reduce IT risks with a defined action plan based on an IT Governance Assessment. All business and IT processes are subject to the following levels of maturity: Initial, Repeatable, Defined, Managed and Optimized. Moving from one level to the next can generate substantial improvement in the effectiveness of an IT organization. 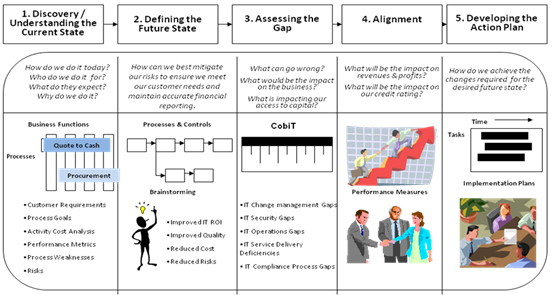 Process Partners has adapted the CobiT 4.1 IT Governance Maturity Model as the framework to measure the effectiveness of an organization's IT Governance..
Information Technology departments are continuously seeking opportunities for improving the delivery of their services and the returns on IT investments. The Software IT Governance Maturity Model is an accepted standard for measuring the current state of an organization IT Governance. Research has proven that both the level of quality and the level of productivity of an IT organization significantly increases with the maturity level obtained. Our methodology utilizes established best practice frameworks to ensure positive and sustainable results.